SCANDIC Bryggen Hotel in Honningsvåg near North Cape in Norway is an ideal destination for a visit to the northernmost point of Europe. Either for the night before, the night after or a longer stay, the cute town of Honningsvåg is ideally located. With just around 2,800 inhabitants Honningsvåg is the most northern City in Norway, in the Finnmark Region. There are two SCANDIC Hotels in the City, I stayed at SCANDIC Bryggen close to the port where the big cruise ships dock. Their Restaurant was this good, I can totally recommend it to everyone in Honningsvåg. SCANDIC Bryggen Hotel in Honningsvåg operates 42 hotel rooms on three floors, making it a cosy Accommodation. The Hotel is conveniently located in a walking distance to a shopping street and the city centre, but for sure there are plenty parking spots right at the Hotel. I stayed in a Superior Room with an 180 cm King-size Bed, an armchair and working table with TV and for sure free WiFi. The Internet is complimentary with good signals all over the Hotel. Due to the late rise of the sun, and the early set, I could not enjoy the views from my Hotel Room in the winter season. More Info on the Hotel’s Facts can be found on their website, including Check-In and Check-Out times. A big surprise was the SCANDIC Bryggen’s Restaurant. As there is no minibar in the Hotel Room you, anyway, have to go downstairs to buy something reasonably priced at the kiosk counter, so why not enjoying some proper meal instead? Their Restaurant is open from Monday to Friday, each from 6 pm to 10 pm, with á la carte ‘choices of delicacies from the Arctic Ocean and specialities from Finnmark’. If you fancy, you can try Reindeer Steak or other options. My evening started off with Beer Tasting from Mack Brewery, the world’s northernmost brewery with their headquarter in Tromsø. We got to try 4 different types, of which the Mack Julespesial Beer was my favourite as it was light and refreshing to drink. The Dinner continued with a Salad with toasted nuts and mustard dressing, my Vegetarian Main Dish Pumpkin filled with mushroom, garden greens, root vegetable mash and lingonberries and was finished off with Cloudberry ice-cream with a corn and cloudberries in syrup with chocolate. The Service was all the time very nice and attentive and the dishes were on point, and beyond. Honestly, I did not expect a Restaurant this good in the most northern City of Norway. Breakfast the other day did not disappoint either, with a big selection of fresh products. From several juices and smoothies to warm dishes, freshly baked variations of bread, fruit salad, several cornflakes and granola with different types of yoghurt and Toppings and what else. Unfortunately, I only stayed for one night at SCANDIC Bryggen Hotel near North Cape in Norway, but I will be back, for sure. I enjoyed their hospitality, and the great Food, therefore an absolute recommendation from me for this Hotel! Velkommen til Nordkapp! 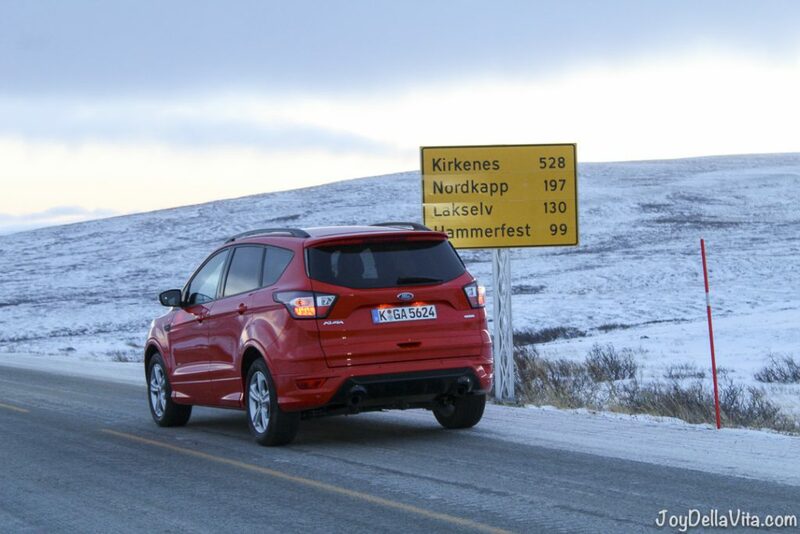 – Welcome to North Cape! Whats that on the plate after the Mack Berg? Hi Alina, that was Reindeer Heart!